Windy first outdoor match of the year. 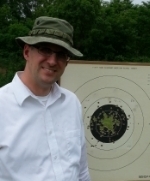 I drove 3 other Wisconsin shooters down to Waterman Illinois for the 1800 and EIC match. IT WAS SOOOO WINDY!!! I checked the weather stations and we were getting sustained winds around 25 mph with 35 mph gusts. During slow fire we were waiting for 15mph lulls....then trying to blast away while the wind was only puffing between 15-20mph. IT WAS SOOOO BAD!!! Gunboxes and lids flopping all over the place. Chasing targets all over the place. It was NUTS!! It was so fun hanging out with those guys, and they put on a great match. THanks to Ralph Wilson and Aurora Sportsman Club for hosting. I can't believe how sore I am just from holding my body and arm against the force of the wind all day. Good times!! By the way, great burgers at Pub West in Waterman, IL!! Re: Windy first outdoor match of the year. Shooting in stiff winds definitely adds a whole new dimension to the day. A good friend once shared a tip he'd received from an old timer at Perry. Once you have attained your proper stance, turn your toes inward to help secure all your muscles. I had the opportunity to try it last weekend at Scarborough F & G (an excellent shooting facility in Maine)in some windy conditions and it seemed to have a positive effect. I shot a personal high and finished first in my class. No great burger, though...had a 3 hour drive home and paid to much for a crappy pizza. Still a great day!